Between the Rafters: Whooo's a fan of spray paint? I believe I have mentioned it before, but I am a huge fan of spray paint. It's amazing the transformations you can make with that little can of color. Just about everything I see I want to spray paint. I'm also a huge fan of owls. They're so cute with their large eyes and little heart-shaped faces. There's an owl that sometimes visits the tree outside my master bedroom window and he'll wake me up with his "whooo whooo" calls. Which leads me to today's project. 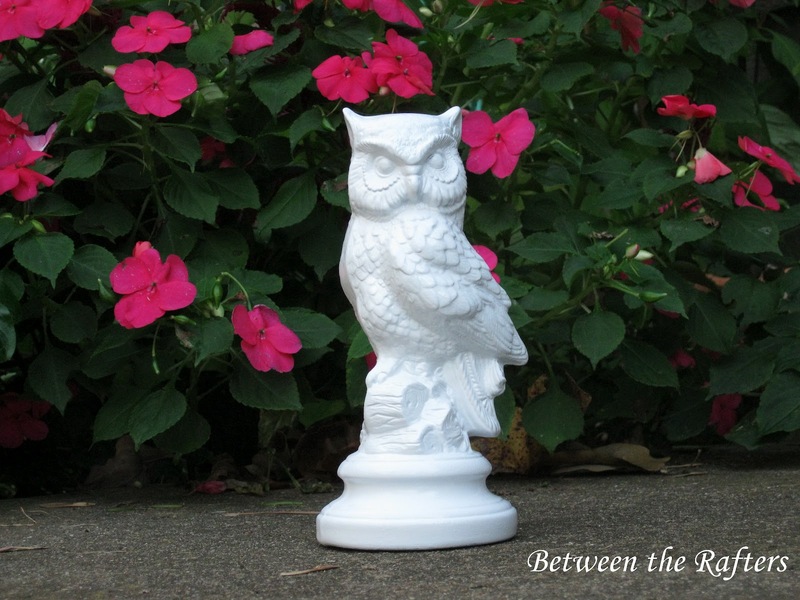 One fast Google search and you can find white glass owls everywhere on the web these days. 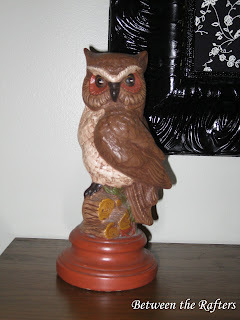 I found this cute little owl figurine at Goodwill and knew he was a perfect candidate! He was priced right under $2. Poor guy, he was stuck in the 70's. No worries, white spray paint to the rescue. Much better. Now he belongs in this decade. He actually sits on the dresser in the master bedroom as in the first picture--the flowers were just a much prettier backdrop.